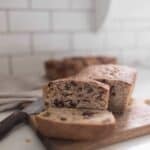 This cinnamon raisin sourdough bread is the perfect healthy treat. With natural sugar, fermented grains and whole ingredients, it can be served for both breakfast and for a snack. The night before you want to make your bread combine the flour, starter, oil, salt, honey and water in a large bowl. Knead the dough until it is stretchy. (about 15 minutes) I use a mixer with a dough hook for this. You can knead it by hand, but if you plan to make bread regularly a stand mixer is a great investment for the time it saves. Add just enough flour so that it pulls away from the sides of the mixer, or is not sticking to your hands. It will vary between 6 and 7 cups, depending on the hydration of the starter and the type of wheat you use. Add a little more water if it is too dry, or flour if it is too wet. Divide the dough into two even balls and place each in a coconut oil greased glass bowl. Roll the dough around a bit so that the entire ball is lightly coated with coconut oil. Cover the dough with a beeswax wrap (page ?) and let it rise overnight, or about eight hours. Also, the night before, get the raisins soaking in one cup hot water. The next day, roll each ball of dough out until they are about ½” thick, onto a lightly floured work space. Drain the raisins, and sprinkle each flattened ball of dough with half of the soaked raisins and cinnamon. Starting from one short side, roll each portion of dough up tightly, so the raisins are firmly in place on the inside. Place the dough into a greased loaf pan, and allow it to double in size. This should take anywhere from 4-8 hours, depending on how warm your kitchen is. Bake the bread for 35 minutes at 400 degrees.